This chapter provides a short background sketch of life on Kalymnos in order to set the stage for my subsequent explorations of cooking. I develop ideas about food provisioning through some of my more recent ethnographic explorations of shopping and gifting on Kalymnos, and also briefly describe some aspects of Kalymnian marriage and family life relevant to thinking about cooking. Finally, I take a look at some of the key values that frame Kalymnian cooking discourses and practices. Kalymnos has always been known for its barrenness, which, while not inimical to agriculture entirely, made agriculture secondary to sources of livelihood from the sea. While the days of the Kalymnian sponge trade, having been in decline since the 1970s, are now almost completely a memory (a "bitter" one at that [Warn 2000]), various sorts of fishing and especially the merchant marine continue to be options for those Kalymnians (men, almost exclusively) called by the sea. During my research in the 1990s, tourism was a much smaller part of the economy than it was on many of the neighboring Dodecanese islands, yet a number of factors have increased the visibility of tourism on Kalymnos during the first decade of the twenty-first century. The completion of an airport on the island means that it no longer requires a fourteen-hour boat ride from Athens to reach Kalymnos, though flights to Kalymnos so far are only from Athens. A spectacular discovery of fifth century B.C. artifacts in 2001 and the subsequent construction of a beautiful EU-funded museum have also raised the tourist profile of the island. But perhaps the biggest impact on tourism has been the discovery of Kalymnos in the late 2000s by rock climbers, which has led to the staging of a yearly rock-climbing festival that draws renowned climbers from all over the world to the island, converting Kalymnos's legendarily arid landscape into a money-making attraction. As one Kalymnian whose wife owned a restaurant and pension noted, Kalymnos is one of the few places in the world where you can climb imposing cliffs by day and relax in the Aegean Sea in the evening. Kalymnos, which had been unknown to all but the most dedicated tourists, was getting all kinds of press from rock climbing, even an article with spectacular pictures in the in-flight magazine for Lufthansa as I flew from the United States to Athens. Kalymnians were promoting their local attractions, not only the landscape and rock-climbing opportunities offered by no other island, but also Kalymnian restaurants. I remember attending a seminar in 2008 sponsored by the Kalymnian restaurant association that encouraged restaurateurs to feature the preparations they had offered all along as "local"-like the Kalymnian version of a Greek "village salad" known as mermizeli.1 By 2011 Kalymnian preparations were being featured in slow-food cookbooks, and several cooking shows (both Greek and American) had devoted segments or whole programs to Kalymnian specialties. These new tourist opportunities notwithstanding, Kalymnos was feeling the pinch of the financial crisis in 2011. The main street of Kalymnos was littered with closed stores, mainly clothing stores. Kalymnians who had always had worked in the building industry or in the mayor's office were laid off. Increasing numbers of Kalymnians were following the long-hallowed tradition of migration from the island to Australia (the United States seemed to be drying up as a migrant destination), and some suggested to me that the population had dipped to nine thousand, draining the young from the island.2 The main Kalymnians moving in the other direction seemed to be women moving back to the island because they had inherited property (matrilineally, see below) that could be turned into tourist accommodations.3 One twenty-five-year-old told me that he had lucked into a job that spring, otherwise he would have joined many of his friends in seeking work in Australia. Some older Kalymnians had acquired Australian passports, even if not seeking work, because they looked to Australia as a backup if life in Greece became intolerable. I realized how much things had changed, however, in 2011 when talking with a woman in her twenties with two young boys. She told me that she was done with childbearing, and that there was no need to "make the daughter." When I asked about carrying on the grandmother's name, she dismissed this idea as the thinking of "the old mind-set," noting that she and her husband were happy with two boys, and that they would try to build houses for them when they grew up but it wasn't necessary: "If you have you give, but if you don't, there's nothing wrong with renting." While first-daughter inheritance is now a memory, certain patterns remain that distinguish the island from mainland Greece, including a greater inheritance of names between the mother's and the father's side than in patrilineal areas, and a strong matrilocal bias in postmarital residence. Mothers and daughters ideally still live together, sharing a large living space between two (or sometimes more) separate but interconnected households. Husbands enter the family as outsiders, and grandmothers, mothers, and daughters are, in many cases, allies in family struggles against fathers or husbands in family decisions about marital, financial, or other issues (Sutton 1998, chap. 5). This can play in interesting ways into cooking practices, where cooperation, negotiation, and affection can come up against claims to authority, hierarchy, and power, not just across genders but between women in the family. The current research project, which got me observing daily cooking in a much more detailed way than I had even in my earlier book about food and memory on Kalymnos, revealed family conflicts and tensions, as well as cooperation and alliances that I hadn't noticed in my earlier studies. A brief description of the typical Kalymnian kitchen is in order. However, it's important to be aware that this is very much an ideal-typical description; as we'll see, Kalymnians negotiate their own practice in diverse ways. Nonetheless, it's also important to note that all Kalymnians seem to be aware of typical patterns and define their own practice in relation to what "other people" do. In some cases mothers and daughters live together but cook separately; in other cases they may live at a distance but still share meals. In most cases, actual practice combines some separation and some sharing of cooking and meals. The description I give here is of cases in which mothers and daughters are living adjacent to each other, sharing some parts of the living space, while other parts remain somewhat separated (for example, the mother may very rarely enter the daughter's bedroom). As people's economic means expanded in the period from the 1970s to the early 2000s, they may have built more elaborate living areas with more "modern" furnishings, but they did not abandon many of their previous living arrangements, in particular the shared, two-family setup. In such a shared living space, the mother's kitchen may be quite small: a space large enough for a sink, a refrigerator, a small table, a wall cabinet for plates, and a two-burner stove run off a gas bottle. It is usually a small room separated from the main living area. Alternatively, a shack outside the house might be used as a primary area for processing and cooking, or a simple covered area that opens up into a courtyard could be used. The daughter's kitchen, by contrast, can be quite large, on the first floor of the daughter's living area, and typically is not a room separated by a divider, but opens on to a larger living space. The daughter's kitchen will include a full stove and oven, and a large amount of counter space with cabinets above and below. The mother's kitchen uses wall space for storage of pots, pans, implements, and often plates. By contrast, the daughter's kitchen will have those items placed in cabinets, and will instead use wall and counter space for decorative items, or sometimes for a kind of display of the tools of past generations. What this setup in some cases allows is for the mother's kitchen to be the primary everyday kitchen for processing and cooking heavy, full meals, and the daughter's kitchen to be much more used for lighter, occasional cooking, cooking of sweets or casseroles, which use the oven, and the making of snacks and coffee. Because the mother's kitchen tends to be outside the house proper, the smells associated with cooking or cleaning fish, and the dirt associated with processing the food, do not enter the living space, which is, therefore, easy to prepare for visitors. Aside from kitchen spaces, many Kalymnian homes have some outdoor courtyard area that can be used for processing food-cleaning fish, cutting up potatoes, cleaning lamb entrails for Easter soup. This may be a multifunction area, used to hang sheets and other laundry, as a garden, or as a space to keep animals of various kinds (goats, sheep, chickens, or hunting dogs being the most typical). This outdoor area allows Kalymnian women to process food for cooking while engaged in other activities: socializing with family and neighbors, taking care of other tasks, or keeping an ear open for an itinerant merchant. Such spaces have also been used in recent years for the building of an outdoor oven, a topic that I explore further on. How much time is spent on cooking activities during the course of the day? Because of the multifunctional and social spaces in which Kalymnians process and cook their food, there is no clear answer to this as there is (implicitly) in typical recipes in the United States that specify time to the minute-fifteen minutes of preparation time, twenty minutes of cooking time, and so on. A typical Kalymnian main meal may begin the night before with planning for the next day and, often enough, the soaking of dry beans overnight for cooking the next day. Preparation of ingredients goes on amid a series of other activities-cleaning, caring for elderly family members, socializing with neighbors, overseeing children's activities, or making a quick trip to the neighborhood church to tend the family graves. Also, because cooking activities may be shared among two or more family members, a woman may run off on an errand, leaving her daughter or granddaughter to tend to the pots, or a man may take fish out into his workroom outside the main house for cleaning before his wife cooks them. Coffee and snacks are also constantly being prepared throughout the day to supplement the main meal (or meals, depending on whether a smaller evening meal is prepared). I observed that time for food preparation was the most focused when one woman was the primary cook for the household and all preparation was done in an indoor kitchen space. Here one could develop concentration on a particular activity; in such cases, cooking a meal generally took from one to two hours. However, this situation was more the exception in my observations. (I consider one such example in detail in chapter 6, in the section on Popi Galanou.) I observed one family preparing a typical Sunday meal of stewed fish, moussaka, and salad. The meat sauce for the moussaka was prepared the evening before, taking one person just under an hour. The main preparations for the meal involved the activities of a husband, wife, wife's mother, and two daughters in steady, if not constant activity for slightly under three hours (the moussaka was cooked in an outdoor oven, which required considerable preparation and tending). While Sunday is an unusual meal, everyday meals also tend to involve at least several hours of labor time if they are done by a single person. Thus the contrast seems particularly striking, for Kalymnians, between homemade food, and preprepared frozen food, which has recently become available in supermarkets. The latter, most Kalymnians insisted, was simply an unacceptable substitute for the main meal of the day, though it might occasionally be used for a snack or an evening meal. The significant time invested in cooking (not to mention provisioning, discussed below) enables one to suggest the value of cooking to Kalymnians, a theme I will return to. As David Graeber, following Nancy Munn, argues: "Value emerges in action; it is the process by which a person's invisible 'potency'-their capacity to act-is transformed into concrete, perceptible forms. . . . One invests one's energies in those things one considers most important, or most meaningful" (Graeber 2001, 45). It is the shared sense that cooking matters to Kalymnian women and men that makes for its value and for the realization of that value in concrete, perceptible forms, in this case the synesthetically pleasing cooked meal. Kalymnian main dishes are made up of beans or meat or fish and vegetables cooked in a "red" sauce of tomatoes, garlic, onions, and parsley or celery. These dishes are supplemented with fish prepared as a soup, fried, or grilled. These meals will always be cooked in generous amounts of olive oil and served with fresh bread (typically bought daily) to soak up the oil and sauce. Little had changed in this regard since my fieldwork in the 1990s (see Sutton 1997, 2001). Sunday is when special meals are typically prepared, and the most typical Sunday meal remains grape leaves, stuffed with rice and ground beef and covered with an egg-lemon sauce. These stuffed grape leaves-called filla-are common throughout Greece, but their centrality in the Kalymnian diet has led people to refer to them as the "Kalymnian national dish." Sunday is also a day when one might make a dish that takes more time, such as moussaka or pastitsio (pasta and meat with a béchamel sauce). This might also be the time to make a spinach, mushroom, cheese, or other filled "pie" (pita), something that was more of a rarity twenty years earlier but that had increasingly become part of the regular repertoire of Kalymnian cooks in the 2000s. Other common meals typically found in the weekly cycle include pasta with tomato sauce (with or without meat) and various cuts of meat and sausages. This main meal of the day, taken in the early afternoon, is supplemented during the course of the day by all kinds of snacks, often based on a special find of greens from a local vendor, a catch of fish, or a snail-hunting expedition.6 The evening meal sometimes involves leftovers, but otherwise would be something quick to prepare like fried eggs and potatoes or an omelet. Cheese, olives, and seasonal fruit are almost always consumed throughout the day as part of meals or snacks. The Kalymnian meal would be recognizable to most non-Kalymnian Greeks as typical "Greek food," with some variations, of course. While the first decade of the 2000s hadn't brought any radical changes to this diet, there were a number of interesting shifts, which I discuss in the course of the book. However, as I argued in my earlier work, there remains the sense of a recognizable, shared Kalymnian cuisine against which variations can be evaluated and judged. An essay included in the application to UNESCO in support of the nomination of the "Mediterranean diet" as part of the World Intangible Cultural Heritage-submitted by communities in Greece, Italy, Spain, and Morocco-states, "In Chefchaouen, Cilento, Koroni or Soria, the market-where sales are sometimes less important than bargaining-represents a special place for socialization and for the recreation and transmission of the Mediterranean Diet. The market is also an essential cultural space of conviviality between the landscape and cuisine, which combines commercial, leisure and cultural activities and contributes to the exchanges and the daily rebuilding of identity. "7 Kalymnos certainly has none of the sense of the bazaar, filled with all manner of foods, entertainers, and other delights, that is suggested in this somewhat stereotypical description of a "Mediterranean" marketplace. But the basic insight of this paragraph, that shopping is deeply embedded in social relations, holds true on Kalymnos. Yet it also needs to be unpacked if it is to move beyond the stereotypes of the Western imagination or the potential self-exoticization of the preceding statement. What does it mean to say that shopping is "social" on Kalymnos? Perhaps both more and less than is captured in the quotation above (about which more is said in the next section). So, how do people shop on Kalymnos and, more broadly, how do they provision themselves to prepare meals? In my earlier research I was struck by what I called the "agonistic" nature of shopping on Kalymnos, in which Kalymnians used their knowledge of prices to get the best deal and to avoid being taken advantage of. I showed that despite the importance of shrewdness, Kalymnians were not the maximizing rational actors of economics textbooks, as the fruits of good bargaining were often turned into openhanded generosity toward neighbors and strangers, and Kalymnians were horrified at the idea that someone would try to make a profit off someone they knew (Sutton 2001, 21ff.). I remember this lesson being brought home to me one day after I had been living on Kalymnos for more than a year (in 1993) when I went to the village of Vathi, which I had visited only infrequently as it was on the other side of the island. There I found a store selling rugs and decided to buy a number of them as gifts for friends back home. After exercising my growing bargaining skills to negotiate with the store owner what I felt to be a fair price, I paid him. But as I was waiting for the bus to go back to the main town, we fell to chatting. At some point he asked about what I was doing on Kalymnos, and I told him that I had lived here with my family for more than a year and that I had made many trips to the island since my first visit as a study-abroad student. On hearing this he visibly blanched. He ran to his cash register and reached in; grabbing out a couple a small notes, he shoved them into my hand, telling me that it was so I wouldn't think that he was trying to profit off someone "from the island." Then he insisted that while I wait for the bus I share a coffee with him, to make sure I had no question about his good character. While there are a number of aspects of this exchange that could be explored, the key thing I want to stress here is that shopping is very much considered to be a moral act on Kalymnos. David Graeber has argued to good effect that in most societies, even advanced capitalist ones, only a portion of people's transactions of goods should be considered "exchange," in the sense of an equivalent transaction in which each side "gives as good as it gets" and the relationship can be ended at any time. Many of our transactions partake of an "everyday communism" in which ongoing relations are assumed and no strict account is kept (families are typically "communistic" in this sense; see Graeber 2011, 94-105). The moral aspects of shopping have become in some ways more obvious on Kalymnos in the first decade of the twenty-first century with the growth of multinational supermarkets on the island, the implications of which are fiercely debated. Prior to the early 2000s there were small, neighborhood grocery stores, along with specialty stores for fruits and vegetables, meat, and fish, as well as itinerant sellers of fruits and vegetables, bread, and other items. Finally, there were many opportunities for special purchases of bulk items like smuggled olive oil from Turkey, cheese produced on other islands, or fish caught by friends and neighbors, as well as shopping excursions to neighboring islands to pick grape leaves, for example. There were small supermarkets that might carry multiple types of products, but these were also locally owned, and many were in fact not substantially larger than, nor necessarily different in pricing from, most of the neighborhood shops. While this shopping landscape had its own complexities, a new dimension was added to shopping after 2000 by the opening of more than a dozen large supermarkets-some locally owned, but others either owned by non-Kalymnian Greeks or locally owned franchises. These businesses use circulars and other promotional devices to advertise their prices and sale items. Let's take a look at some of the competing pushes and pulls of Kalymnian shopping, first through a discussion that I had about the opening of these new stores with Dionysios, a Kalymnian man in his early eighties, and his niece Nina (his wife's sister's daughter and the subject of chapter 3). Dionysios lived in the United States for roughly thirty years, working as a shoemaker in the Kalymnian community in Campbell, Ohio. With his wife and two daughters he traveled back and forth, spending time on Kalymnos in the late 1970s and then living in Athens, where his daughters were working, for much of the 1980s. At the end of that decade he returned for good to Kalymnos, where he continued to work out of his house as a shoemaker until he retired in the late 1990s. We began with a discussion of different techniques for preparing octopus stew, in which he was comparing the benefits of removing the sea water from the octopus and adding salt, versus cooking it in the salty sea water. I asked Dionysios whether he participated in the cooking and shopping in his household, and this led into a discussion of his shopping preferences and his feeling that the new stores needed to be rejected. But what started as a monologue quickly turned into a debate as Nina jumped in to dispute his claims. NINA. You're looking out for your friend, but it's not benefiting your wallet. NINA. He's not my friend. DIONYSIOS. -and for the ten cents that I will lose, should my friend close his shop and be destroyed? We need to support him, because the money that he will get [from people shopping] or that your friend will get will circulate here, they'll buy a house, they'll build something, they'll do something. NINA [switching to English]. Your friend doesn't even pay rent and he's still more expensive. DIONYSIOS. I can't watch my friend destroyed to gain a dime. Let me give up my dime to support my friend and my countryman [getting heated] and so that the money remains here, so it doesn't go to Germany and who knows where and people go hungry here. DIONYSIOS. This is my philosophy, I don't know what you think [in English]: I don't care for ten cents. . . . Better to support my friend and to lose each week, what do you call them? One euro. NINA. You don't lose one euro. DIONYSIOS [waving his hand]. Two euros. DIONYSIOS [waving his hand]. Three euros. NINA. Are you willing to lose ten? NINA. What do you mean? I'm not going to foreigners, I'm going to locals. To the Source [a Kalymnian-owned supermarket]. DIONYSIOS. The Source is cheaper? NINA. A thousand times cheaper. Your friend is the most expensive in Kalymnos. They argued about the prices of different items at different stores on Kalymnos, with Ninainsisting that her uncle's friend's shop was "on fire" with its high prices, even more expensive than the small neighborhood stores (which are expected to have higher prices than the supermarkets). Nina gave the example of a can of milk being ten cents higher, and Dionysios said again, It's only a dime. Nina insisted that you buy milk twice a week, so it adds up. DIONYSIOS. In any case, my friendship and my honor, I'm not selling it for a better price. NINA. But he owns the building, and he doesn't even have to pay employees since he and his wife work in the shop. At least he could have things the same price as the neighborhood grocery stores. Here they had a heated exchange questioning who had the prices right, with both insisting that they'd carefully compared. Nina pointed out that her aunt-Dionysios's wife-shops at the non-Kalymnian supermarket, because it's much cheaper than the one he goes to. Dionysios said, "How would she know, since she doesn't shop at my friend's?" Nina replied, "Well, she sees the prices of the things you bring home." DAVID. It reminds her of America? DIONYSIOS [laughing]. Such are people's idiosyncrasies. 1. The husband recently died, so we should support the family by shopping there. 2. The family are known communists, so some people don't shop there. I feel like I should help them out to make up for this. 3. I shop from the people at the grocery store up the street who are struggling to make a life for their family [viopalestes], whereas the one closer by is rich, he has bought property in Athens with all the money he has made off his customers. He is also a Greek from Turkey [Boudroumianos]. Those people are smart, but they also are always putting making money first. 4. I shop at the store where the owner was a fellow student with my aunt [who lived with her], because I always felt a connection to her. 5. There is a common practice on Kalymnos now of shopping from supermarkets for some items, but hiding the bags as you walk through the neighborhood so that the local grocery-store owner will not see that you have shopped somewhere else. These examples all stress connections of different kinds, and highlight the fact that shopping on Kalymnos, as I learned with the rug merchant, is not exclusively or perhaps even primarily about getting the best deal. Indeed, as Nina insists in her argument with Dionysios, it's not that she's trying to get the best price without considering other issues, it's that she feels that the store he shops at takes advantage of Kalymnians by putting the store's profits before the community. The important thing is to engage in socially embedded shopping, as is the case with all of these examples, while also not feeling that you are being taken advantage of. As always, this may be a matter of interpretation. One woman told me about how she wasn't intending to buy a lamb for Easter because her husband had died and she was only one person, but the butcher had called and said that he had a lamb with her husband's name on it (as they always bought from this butcher), so she had said, "Yes, I'll take it." It appeared to me that he was taking advantage of the widowed woman, but this was not how she seemed to interpret it; rather, she took the call as the butcher recognizing a good memory of the past Easters with her husband. It no doubt made a difference that since her husband had died, the butcher had often called to offer little favors to her, delivering not only his own products to her door (all butchers do this as a way of competing against the supermarkets), but also drinking water and whatever else she might need delivered. Such negotiations also play out in the practice of rounding down measurements in favor of the customer, which is particularly done with the nondigital scales used by smaller stores and itinerant merchants. A fruit merchant selling to a regular customer, whose daughter was close friends with the seller's mother-in-law, rounded down the price of any item that was under 50 cents (and added in the price if it was over 50 cents).8 He also passed on at no cost a number of fruits that were overripe, and when the final tally came to slightly over 41 euros he rounded it down to 40. Buyers expect to pay slightly more for the convenience of having the merchant come to their doorstep, but at the same time this woman expected that higher price to be balanced by special treatment, considering their ongoing familial relationship. The same attitude-what I'm calling "socially embedded shopping"-is shared by the merchants themselves. For example, many of the smaller stores are in the habit of offering credit to known customers. The foreign-owned supermarkets do not do this, but some of the locally owned supermarkets do, partly because they know their customers so well. Credit is also offered by the itinerant fruit and vegetable sellers. The word for credit-verese-evokes an old-fashioned practice associated with the days of sponge-diving on Kalymnos, when sponge divers would be gone for six to eight months out of the year and would be paid in one lump sum. In 2011 a number of people mentioned the "return" of verese; although it was never completely abandoned, this sense of return reflected the more dire circumstances of the economic crisis. Some store owners said that they offered it, but you had to be careful whom you offered it to. One local grocery store owner stopped carrying international phone cards because, he said, too many people were buying them on credit; he stopped carrying them rather than refuse people credit. An itinerant fruit and vegetable seller said that he would always give food to a hungry person, but he complained about giving credit to some people only to have them choose his best produce and then never buy from him again. "Kalymnians are generous, but they don't want to be taken advantage of," he noted, reflecting a sentiment shared among buyers and sellers. A neighborhood grocery store owner admitted that she was embarrassed about telling people the prices of items after the recent rounds of new taxes imposed by the Greek government. She was very aware that people were comparing prices with those at some of the big supermarkets, including ones from outside Greece, which could buy particularly cheaply because of their monopolies, and she was disturbed not that she would lose all her customers, as there were always people coming for some small purchase that they had forgotten, but that her neighbors might think she was trying to make a profit off them. She admitted that she could survive partly because she uses her house as her store space and doesn't pay employees, but this merely allows her to get by. "We used to live well, now we are the store of last resort," she said, speaking to the plight of many of the neighborhood groceries. Dionysios's comment about his wife shopping at some of the big, foreign-owned supermarkets because she wanted to get a break from her day-to-day routine (and because it reminded her of America) was a not uncommon sentiment on Kalymnos. Particularly for older, married women, shopping was one of the few activities, aside from going to the church, that legitimately took them out of the home space, and so it was a way of taking a break from home stresses (stenohories).9 Thus, women might go to a number of different stores for grocery shopping in order simultaneously to comparison-shop for bargains, fulfill obligations to different store owners, and let off steam or unwind. The point, then, is that shopping is a multifaceted activity, only one piece of which involves any abstract calculation of value for money. This was true even in the face of the economic crisis in Greece in 2011. When I asked people about how they were responding to the crisis in terms of their shopping habits, some suggested a return to more beans in the diet (as opposed to meat), while others argued that the foreign supermarkets had opened up the possibility of getting many different cuts of meat, so that rather than reduce meat, families might buy cheaper, imported cuts. People noted that there were hazards to this as well, as you had to worry about the provenience and freshness of the meat sold at the foreign supermarkets. But they also commented that people were not as embarrassed about asking for a lower-quality product as they might have been in the past. Others still suggested that there was something shameful about worrying too much about prices: rather like Dionysios, one older woman replied with a dismissive "pa, pa, pa" when I asked if she shopped at the big supermarkets in order to save money. In the practice of buying cheaper foreign meat we also see some of the conflicting values that might come into play in food choices: both the notion that local, Greek-produced food is superior (see below) and the idea that men have grown accustomed to eating meat and cannot go without-"It's a male thing, feed him some meat, and make it bloody!" (agori prama einai vale na faei keataki kai na ehei kai ligo aima). One woman casually mentioned needing to add meat to a dish of green beans and potatoes she was making since the men would be home for lunch, and they would expect meat. As another woman put it to me simply, "My son-in-law would die without meat." On the other hand, eating too much meat is known to be unhealthy and is talked about in terms of some of the unhealthy changes from more "traditional" eating habits.10 It is balancing such competing imperatives that makes shopping a constant topic of conversation, and sometimes of conflict, as we saw with Dionysios and Nina. But there is another aspect of food shopping that I only half recognized in my earlier work. While I wrote about the ways that Kalymnians would try to get good deals in order to have more to share (with visitors, strangers, and sometimes neighbors), I didn't take in the extent to which shopping was only one piece of a more general system that, for many Kalymnians, involves constant multiple lines of "exchange"-though once again I'm using this word not to imply the kind of "equivalent exchange" of economics textbooks, but rather a sense of flows of debt and obligation. Let me give one example of such flows: Angeliki (about whom more is said in chapter 6) is a widowed woman in her early seventies. Children of friends pass by her house on a regular basis and offer to carry anything heavy that she needs. She always keeps sweets of some kind on hand to offer to them. She makes twice-weekly trips to the cemetery in the center of the island to care for her family gravesites. A nephew fixes the headstone and refuses payment; she tells him to come for coffee whenever. She has a taxi driver whom she has known for a long time who insists that she call him to take her where she needs to go for a lower price. Angeliki often brings a beer or whatever else is at hand to give to him. She prefers this taxi driver because he has children to feed, while many others are single. When she is done she hitches a ride back on the main road. When cars pass without acknowledging her she shakes her head, laughing at the perceived slight. Within five minutes she is invariably picked up by someone-a priest, a family friend, the daughter of a woman who worked as a servant to her family, who had her stop at her house to give her a plant cutting that she had been wanting to pass on to her. Sometimes she takes the bus, noting that one particular bus driver will refuse to take a ticket from her because of the help her husband offered him when he worked in the mayor's office. She brings him cookies. Angeliki's daughter sends 50 euros a month for her to buy things for one of the local monasteries of Saint Katerina, where she often goes for different ceremonies, and where she knows many of the nuns. When they have too much of anything they redistribute it to another monastery, and there is also the "meal of love" that the church offers daily for poor and disabled Kalymnians. Angeliki holds the memorial ceremony for her husband at this monastery, and they never charge her for this service. Her neighbor who fixes appliances went to the monastery at her instigation to fix their refrigerator when it wasn't working, so when he held a memorial for his father there, they, of course, again refused to take any payment. These were some of the exchanges that I recorded over an ordinary two-week period. At one point I asked Angeliki to keep track of all of the exchanges, but she was too embarrassed, saying that these are not things that you write down. I was trying to objectify and quantify these flows when the point was that no strict accounting should be kept-just as with the gesture of the rug-shop owner who didn't count the "discount" he offered me. I felt at that moment like anthropologist Richard Lee, who when trying to keep track of exchanges among his !Kung informants was finally told clearly, "You see, we don't trade with things, we trade with people" (cited in Cronk 1997, 160). As Graeber (2011, 386) notes, "The difference between owing someone a favor, and owing someone a debt, is that the amount of a debt can be precisely calculated." This is not to say that there aren't many occasions for misunderstandings to arise that may strain or break relationships, and the theme of "ingratitude" or "betrayal" is never far from people's minds and lips.11 But that doesn't keep people from continuing to build such relationships, which are, in fact, the very fabric of Kalymnian society. These types of acts are seen as a human ideal that all should strive to approach, coming as close as one can to the ideal of the gift of Christ. Purely commercial relations are seen as lying at the opposite end of the spectrum, a turning of social relations into profit.12 This contrast was brought home to me when a woman noticed a Gypsy trader eyeing the watermelon that she was serving to her family on a hot day. She told the trader that if she wanted to come join them, she should forget about her wares and come share their food and keep them company. It is in the context of this ethos of sharing and trust that people can speak of their choice to buy at the local grocery store as an "act of charity" (elaiamosyni). I am in strong agreement with the idea that values must be studied in relation to practices, rather than in the abstract, which is one of the reasons that I argue for a cooking ethnography that goes into kitchens to observe everyday cooking. With these provisos in mind, however, let's explore some of the key values that Kalymnians express in relation to food as a way of framing some of the issues we'll be looking at in greater detail in later chapters. 1. We know that, in our times, globalization and the pace of life are such that other, more harmful foodstuffs dominate eating habits. The shift towards healthier eating habits and ways of life has become no longer a luxury but a necessity. These statements capture ideas found on Kalymnos and throughout Greece that eating is a total social fact, incorporating health, taste, tradition, and a strong sense of local place, a Greek version of the French concept of terroir. Eating well-in the sense of both health and taste-means eating food that has been produced in the traditional fashion, with traditional recipes and without "modern" fertilizers and pesticides (note that the Greek word for organic translates literally as "biological"). Authentic food is local food, locally grown in the particular conditions of climate, soil, and sun of different regions or even villages of Greece, with different knowledge of particular local ingredients, herbs, and spices, and with different local traditions, customs, festivals, and particular regional and local histories. There is also a sense that authenticity always belongs more to the past, only fragments of which can still be accessed today. And it is, of course, a rural phenomenon, which urban Greeks romanticize as part of their village origins. In some ways this could be seen as part of a "self-exoticization" through cookbooks, cooking shows, and other forms of culinary tourism that celebrate the local as well as, recently, the cuisine of Greek minorities for the benefit of a largely urban, middle-class audience, and may even serve as a form of social capital and "distinction" in Bourdieu's sense.15 However, as I explore further later on, this discourse of terroir pulls on longstanding issues in Greek society about the meaning of locality. Eric Ball, for example, suggests the significance of place, environment, and landscape in Greek literary discourse in the twentieth century. He notes the significance of naming plants and other features of the landscape as part of an "ecological awareness" that is seen as tied to a cultural identity: "Authors regularly invoke even scientific taxonomies in ways that blur or intertwine social and ecological boundaries, cultural identities and the facts of natural science" (Ball 2005, 8). C. Nadia Seremetakis's discussion of the implications of EU regulations on Greek agricultural products (1994) both analyzes and partakes of a common perspective in Greece that ties social reproduction to particular, local and embodied sensory, medicinal, and skilled knowledge of food and other material objects.16 The notion that this knowledge would serve as a buffer against the negative aspects of modernity is implicit or explicit in such views, as is clear in the first statement from the Mediterranean diet letters quoted above. But it is not just because "The shift towards healthier eating habits and ways of life has become no longer a luxury but a necessity." Rather, it is because in keeping some aspects of "modernity" at bay, it is not only health and local landscapes but also cultural identities that are being preserved and revalued, through a conscious embrace of traditional cooking and eating practices, while what are seen as the positive aspects of modern life are simultaneously embraced. This is what I refer to as "existential memory work" (Sutton 2008)-that is, on Kalymnos, the issue of how to live in the present remains a question of what to remember and what to forget, or how to place oneself and others in timein a way that both recognizes continuity and acknowledges change. Such complexity was at work also in some of the Kalymnian restaurants that were featuring "local" or "Mediterranean" cuisine. I spoke with Evdokia Passa and her mother, Aleka, who had owned the restaurant named, after Aleka's deceased husband, Harry's Paradise. Their restaurant and rooms for rent, in the small village of Emborios, featured a stunning flower garden out front. In the back they kept a small vegetable garden to stock their kitchen, but otherwise they bought much of their produce from an organic farmer who lived in the village. The restaurant had developed over time from a traditional Greek restaurant with noted specialties such as papoutsakia (eggplants stuffed with a meat sauce), reflecting Aleka's upbringing in mainland Greece, to a more recent focus on local sourcing and "Mediterranean cuisine." Cost plays into food values, as noted above, though as we'll see, the stress on "simple" food also means that many Kalymnians dismiss expensive food as "putting on airs" and in fact not tasty or worth the money. Convenience plays into people's values in more subtle ways: the issue of time pressure and time management was raised as significant by some Kalymnian cooks (cf. Silva 2010). Convenience might also account for the choice of whether to cook a meal in the mother's or the daughter's kitchen, but it is not one of the core values associated with preparation of food, which is supposed to deserve and demand effort (effort, of course, which is largely the responsibility of women). Indeed, the rise of fast food of various kinds on Kalymnos is seen as one of the aspects of modernity that is putting health and cooking under threat for the younger generation. In 2008, before the economic crisis had hit Greece, I heard much outrage expressed by middle-aged and older Kalymnians that younger women spend more money on clothes than on food; this is seen as a particular attack on tradition, because clothes are considered foreign (most are not made in Greece), while food is, as noted, ideally Greek. Clothes also represent a concern with appearance, while food is internalized, making fast food seem even more of a threat, not just to health but to identity in general. It should be noted, though, that different kinds of fast food have different meanings, from the hamburgers and other Americanized fast food associated with a Greek chain like Goody'sto the more "traditional" fast food on Kalymnos, souvlaki, and to partially prepared food, now increasingly available in supermarkets. Many Kalymnian women insisted to me that they would never consider buying prerolled phyllo dough at the store, much less prepared frozen spinach pie, though a few did note that the latter could be useful if guests dropped by unexpectedly. One woman, a nursery school teacher, noted that fast food hadn't really inundated Kalymnos because there was no Goody's or McDonald's like they have on neighboring Kos, but that when Kalymnian students go to Athens, they go crazy for fast food and since their bodies aren't used to it, it affects them more. If there is a "key" food value on Kalymnos that encompasses all the others, it is surely taste. Taste is the touchstone in assessing food, and it encompasses other values in the sense that "traditional" and "simple" food is also tasty food. Taste is constantly referred to in assessing prepared food, and Kalymnians take pleasure in their ability to distinguish small variations in dishes, as well as to assess the quality of different ingredients.19 And it is the taste of food that, as I argue in my earlier work, is key to unlocking memories of all sorts, personal, familial, local, and national. Abarca (2006) and Adapon (2008) argue that taste-sazόn-is central to discourses about Mexican cooking and forms a "sensory epistemology" guided by memories, personal histories, embodied knowledge (Abarca 2006, 54), and "precisely that inexplicable quality that sets some cooks apart from others" (Adapon 2008, 22). On Kalymnos, taste is seen as individual but within a range of known quantities. People may debate the taste benefits of cutting versus grating tomatoes for a stew, or of peeling them versus leaving the skin on, and the amount and varieties of ways to salt a meal. Some Kalymnians do talk about the importance of "love" to proper cooking, and others about the little "tricks" that create flavorful foods. But with a rare exception or two-those who might say "I'm easy about food"-Kalymnians assert the importance of good, tasty food in their lives. As Manolis, a fisherman and seasonal migrant to the United States, asserts: "Good food means a good life. Because we work to eat well. And if the food is crappy [halia], life is crappy!" In exploring the value of weaving in a South India community, Soumhya Venkatesan draws an analogy with the value of cooking: "Mainly undertaken by women, cooking is a necessary chore, although care is taken in preparing a meal. But there are times, on feast days or special events, when people delight in cooking fine and special dishes. On such occasions both men and women plan and cook the meal and there is much discussion about what to make, how it will be prepared, and by whom" (2010, 159). On Kalymnos it is perhaps not an exaggeration to say that every day has that quality of a special event when it comes to cooking. Even though dishes are standardized and repeated according to a common pattern, there is nothing taken for granted or purely chorelike for most Kalymnians in the daily decisions and preparations of meals. And cooking is not devalued as "women's work," but seen as essential knowledge in producing high-quality meals and publicly recognized value. In an American context the phrase "we work to eat well" seems strange and perhaps sounds too much like "will work for food," an act of desperation rather than a philosophy of life. But in fact, it brings me back to my comments about the significance of "authenticity," which is not simply a characteristic of certain foods; to eat with authenticity is a characteristic of being human, and the opposite of authentic food is "plastic" food: something nonbiological, essentially nonhuman. Food fit for human consumption is food fundamentally in agreement with a dignified human existence-what people at the local level recognize as the correct or right way of existing as human beings. The same is true of shopping, sharing, and provisioning. Too often anthropological analysis has embraced the idea of "cultural capital," that people's consumption choices are about status and "distinction," as Pierre Bourdieu famously argues. I don't want to deny that considerations of status play into such actions, but I also have wanted to stress their existential quality as well, that they are really addressing questions of what kind of person we want to be and what kind of society we want to live in. This is why I argue that the important thing on Kalymnos is not only to engage in socially embedded shopping but also to not feel taken advantage of. This is what the Kalymnians are saying when they refuse to keep track of favors and turn them into debt. Doing so would cancel out the way the system is supposed to work, which is really why you should also not feel you have been taken advantage of. Being taken advantage of means that you feel the other member of the exchange has tried to make profit out of a relationship that is part of a system in which profit is allowed only at specific times, under specific conditions, and only in moderate amounts. The refusal to turn favors into debt and "keep track" while also making sure they are not being taken advantage of is the way locals reflect, and reflect on, their choices of how to organize their social world. The quotes from the UNESCO application illustrate these points in that they state that these dietary concerns are not "isolated recipes for preparing food," they are addressing the question of "how" we reproduce this moral system of socially embedded shopping, cooking, and eating. 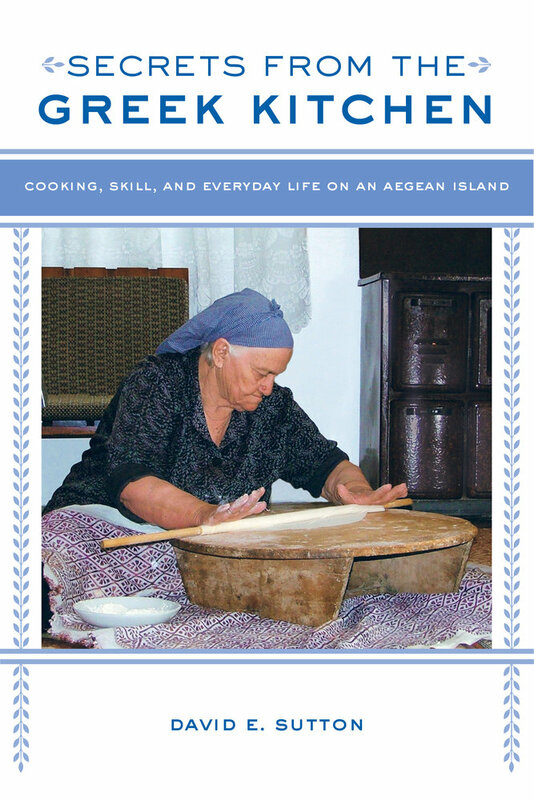 Secrets from the Greek Kitchen explores how cooking skills, practices, and knowledge on the island of Kalymnos are reinforced or transformed by contemporary events. Based on more than twenty years of research and the author’s videos of everyday cooking techniques, this rich ethnography treats the kitchen as an environment in which people pursue tasks, display expertise, and confront culturally defined risks. Kalymnian islanders, both women and men, use food as a way of evoking personal and collective memory, creating an elaborate discourse on ingredients, tastes, and recipes. Author David E. Sutton focuses on micropractices in the kitchen, such as the cutting of onions, the use of a can opener, and the rolling of phyllo dough, along with cultural changes, such as the rise of televised cooking shows, to reveal new perspectives on the anthropology of everyday living. David E. Sutton is Professor of Anthropology at Southern Illinois University. He is the author of Remembrance of Repasts: An Anthropology of Food and Memories Cast in Stone: The Relevance of the Past in Everyday Life and the coauthor of Hollywood Blockbusters: The Anthropology of Popular Movies. Introduction: Why Does Greek Food Taste So Good? 3. Nina and Irini: Passing the Torch? Conclusion: So, What Is Cooking? Please make sure you have installed the latest version of Adobe Flash Player to view these videos. 1. “Cutting Medley” (2005). Katerina Kardoulia cutting potatoes for a stew, Nina Papamihail cutting an onion for a salad, and Katerina’s granddaughter, called Little Katerina Miha, cutting zucchini for an omelet. 2. “Polykseni Cutting Eggplant” (2008). Polykseni Miha slicing eggplant. To watch this video with subtitles, go to YouTube and turn on closed captioning. 3. “Polykseni Making Mushroom Pies” (2008). Polykseni Miha and the author rolling phyllo dough. 4. “Evdokia Rolling Dough” (2011). Evdokia Passa rolling dough in her restaurant kitchen. 5. “Georgia Rolling Dough” (2001). Georgia Vourneli rolling dough for a leek pie. Video by Michael Hernandez. To watch this video with subtitles, go to YouTube and turn on closed captioning. 6. “Katerina and the Can Opener” (2006). Katerina Kardoulia opening a can of tomato paste. 7. “Nina Making Octopus Stew” (2005). Nina Papamihail preparing an octopus dish in the kitchen of her summer home. 8. “Kitchen Choreography” (2006). Katerina Kardoulia and her daughter, Katina Miha, preparing several dishes for a Lenten meal while negotiating the limited space of Katerina’s kitchen. 9. “Little Katerina Learning Cooking” (2006). Little Katerina Miha preparing a zucchini omelet for the first time, under the direction of her mother, Katina. 10. “Little Katerina Making a Salad” (2008). Little Katerina Miha making a salad for her father in her grandmother’s kitchen. 11. “Little Katerina Describing a New Dish” (2012). Little Katerina Miha describing how she started making her own béchamel sauce instead of buying it from the store, and also how she prepares a dish with rice and vegetables.